Illustration: Helene Davis. Black Rain. 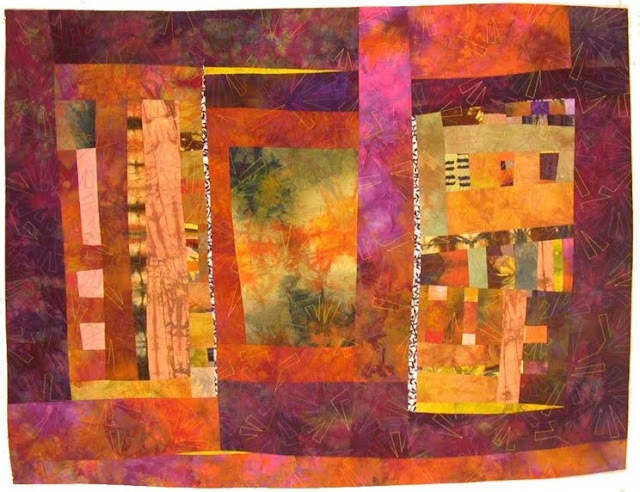 Probably the most fundamental and guiding principal that colours, literally, the work of textile artist Helene Davis is that of her passion for hand-dyed fabric. 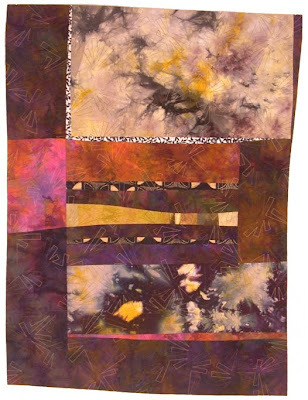 Davis, after using bought quilting fabrics for a number of years, moved into the process of hand-dying her own fabrics, making each quilting project a much more personal and individual process. Illustration: Helene Davis. Black Rain (detail). Hand-dying is an exciting but often less than accurate medium in which to work. It takes a lot of skill, time, and patience in order to arrive at a range of fabrics in colour-ways, tones, and scale that can easily be worked with. The fact that the images shown in this article have arrived at that point, is easily evident. Davis is in control of the medium from start to finish. By producing her own dyed fabrics, she is able to forge a link between colour and texture that is both personal and individual, something that can never be truly said for bought fabric. Illustration: Helene Davis. Flight to the Future. The abstract process and the compositional layout allows the artist free reign over colour balances, textural juxtapositions, and tonal harmonies that seem effortless to the viewer, but are obviously hard to produce creatively without appearing indistinct and in many ways incomplete. Davis is well aware that her coloured and textured fabrics have to balance compositionally, optically, and even emotionally. Each of these compositions has areas that are cut up into smaller sections of light and dark, placed next to areas where the dyed fabric is allowed to expand over much larger sections of the work. This carefully balanced juxtaposition helps to break up the colours and textures and allow the eye to roam over the composition, picking out small sections and details of interest. 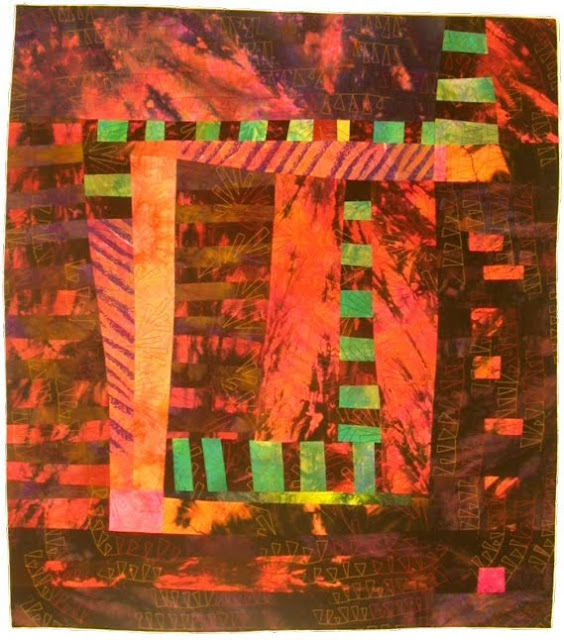 Close ups of Davis work show that the stitch-making is also part of the process, as it is in many art quilts. However, by looking at a close up detail of Black Rain for example, it can be seen that the artist has also added a whole section of beading work as part of the textural and tonal process. This added mark-making process produces yet another layer of textural quality to the piece, allowing the work to be seen from a distance or close up, producing a different quality and experience every time. These abstract pieces of artwork have been created by using a number of the processes found within the hand-dying craft and that of quilting. However, the way they are re-used and re-combined allows the artist to produce an extraordinarily tactile and sensory experience of colour, texture, and tone. Each piece is a balanced use of these processes, and one that cannot be re-conceived or re-connected after its creation. Illustration: Helene Davis. World Upside Down. The work of Helene Davis can be found on a number of sites on the Internet. Some of her work can be seen here. There is also a site, which can be found here, where many more of her hand-dyed fabrics can be seen. All images are used with the kind permission of the artist. these i like. shows a lot of what i learned at art school. play of chiaroscuro. Helene's work in spectacular, instinctive, and exquisitely wrought. Her use of color and line are unsurpassed and her pieces communicate depth both emotionally and visually. Thank you for recognizing her talent as a dyer and as an artist. Hello. Beautifull ! I can see why you are on Marguaret blog. Un little hello from Switzerland. Oh, John! This is wonderful! Helene is a friend of mine and an absolutely incredible person! We are in the same fiber art group here in Paducah. We meet monthly and have a pot luck and a "show and tell" and I always shake when I see her pieces. I think these are older pieces in the photos. 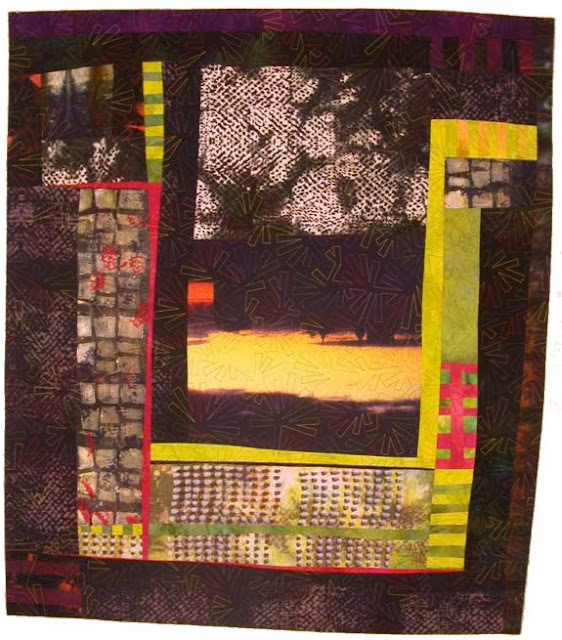 Her latest work is quilted with straight lines all in one direction, very close together, maybe 1/4 of an inch apart. It creates another level of texture and color to the design. These latest quilts have such density that they make me think more of rug or tapestry than a quilt. Her pieces are usually on the small side, maybe 3x3 feet, but powerful. I really love Helene's work, admire her with all my heart, and am so pleased to see her here! Rachel, I had to cut and paste your comment as blogger seems tempermental and refuses to publish it. These do seem older images, but I was intrigued with the self-dying technique which seemed to play such a large part in the art pieces that it didn't seem to matter too much that they were not strictly contemporary. However, I would be interested in seeing Helene's new work. From personal experience I know that dying both fabric and yarn is a skilled but often emotional process, and while you may get lucky 'suprises' it is often quite difficult to produce exactly what you want and need. Dyers are part of a skill craft that seems to get less than their fair share of publicity, as it is often seen as part of a process rather than a medium in its own right. I think that perhaps it would be worth while if The Textile Blog published a series of articles on the work of dyers, past and present, so watch this space as they say. John -- dyeing fabric can be very unpredictable -- but always exciting. I started printed on my hand-dyed fabric because I am such a lousy dyer and needed to camouflage the blotches. Now my printed work has taken on a life of its own - LOL -- and when I need beautiful hand-dyed fabrics, I turn to Helene. You should e-mail her and ask to see pix of her recent quilts. Awesome post...thanks for giving a hand dyer some recognition! Helene's work is beautiful. i guess dying yarn is easier. No, I wouldn't say that dying yarn is any easier. There are just a different set of processes and potential problems. Thanks for the information Rayna. I do still think that the whole subject of 'dyers' is well worth looking into and I have made a note to expand The Textile Blog into that area, when time permits of course! Helene's fabrics are unique among hand dyers. I have tried to duplicate the markings she gets and have failed miserably. She is truly a master dyer! Love, love Helene's work. Her fabrics are to dye for.